Top Tickets: Snoopzilla & Dam Funk, the Weirdos, and Ethio Cali Play Gigs in L.A. This week’s must-see L.A. shows include Ethiopian-inspired jazz, old school punk, and retro-modern G-Funk. 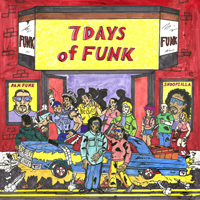 TUESDAY: Released today on the Stones Throw label, 7 Days of Funk is one of the more exciting collaborations of the G-funk genre. Named after the amount of time it took to record the album, it’s a love letter to the West Coast “gangsta funk” that people were bumping on the streets of South L.A. in the 1980s. 7 Days of Funk is a collaboration between Snoopzilla (you may know him as Snoop Dogg or Snoop Lion or Calvin Broadus) and Pasadena-based Dam Funk, both of whom are disciples of artists like Rick James, Zapp & Roger, and Slave (lead singer Steve Arrington appears on the track “1 Question?”). The album showcases Snoop’s abilities as a singer. To celebrate its release, there’s a party featuring a performance by the group with special appearances from Bootsy Collins, Egyptian Lover, and Stones Throw founder Peanut Butter Wolf. Exchange LA: 618 S. Spring St., DTLA Tix: $25. FRIDAY: Formed in 1976, L.A. punk darlings The Weirdos have reformed to show a new generation of music fans how it’s done and to allow the people who were there in the beginning soak up the nostalgia. In a 1977 interview with Slash magazine, the boys aiming to distance themselves from the punk scenes in New York and London proclaimed they were simply “weirdos, from Hollyweird.” Fun fact: Members John and Dix Denney, are the sons of the late Dodo Denney, who played Mrs. TeeVee in the original Willy Wonka & The Chocolate Factory film. Also on tonight’s bill is the Middle Class; formed in 1977, they were the first OC punk band to crack into the LA punk scene. Echoplex: 1822 W. Sunset Blvd., Echo Park. Tix: $24. SUNDAY: Los Angeles’ own Ethio Cali is an ensemble lead by well respected LA based trumpeter and arranger Todd Simon, who’s known for working with a diverse roster of talent including Antibalas, Quantic, Mayer Hawthorne, Quadron, and Sharon Jones & The Dap Kings. The band’s sound is inspired by the golden age of Ethiopian jazz in the 1960s, although they’re also influenced by music from other parts of the world. Tonight’s show, the last installment of their residency and their last show of the year, will feature their take on music from across Africa with selections originated by Orchestre Poly-Rhythmo, Hugh Masekela & Hedzolleh Sounds, Fela Kuti, and Les Ambassadeurs, among others. The band will also play a tribute to Nelson Mandela. The Blue Whale: 123 Astronaut E. S. Onizuka Street, downtown. Tix: $10 at the door.